Do you have a YouTube Channel? Do you want to rank your video on YouTube search result? YouTube video ranking is one of the best ways for YouTube marketing. If you can rank your video on YouTube search result for your targeted keyword you will get your targeted audience on your video that will help you to grow your marketing and increase your conversation rate. So now the question is, is it easy to rank YouTube video on YouTube search result? Not as easy as you think, and also not as hard as you afraid. 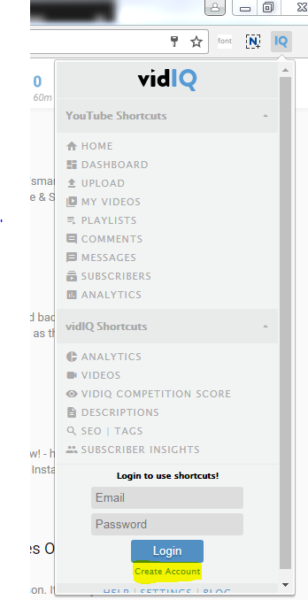 You just need to follow some ways to rank your video and vidIQ extension can help you so much for this. What kind of information can I get by vidIQ? How to install vidIQ on the browser? And how to create an account? 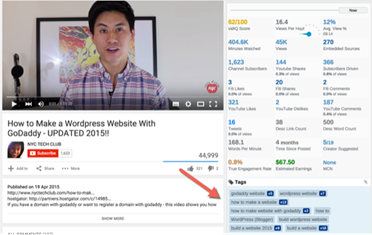 vidIQ is a Chrome Extension that helps you for YouTube marketing. By using this extension you can get a smart data for any YouTube video, and also optimize your video for YouTube SEO. It is YouTube certified Extension so for this reason, it is 100% safe to use. What Kind of Information Can You Find? If you click on a video you can find some valuable information. Information includes how much this video is socially Engaged, YouTube Engagement Rate, SEO score, tags of this video, search result rank for these tags and other SEO data. Now you may think why you need to know this information? Let me explain, do you know about competitor analysis? This is an important factor for SEO, to rank on a keyword you need to know about your competitors and their position for this keyword. If you can do better competitor analysis than others then you will rank for this keyword. So, for this reason, you need to know about your competitor. Suppose your keyword is “Make Money online” Now you can search for this on YouTube and see details for the first video for this keyword and then make your plan to rank your video. So to know about your competitor you need to use vidIQ. Or go to https://chrome.google.com/webstore/detail/vidIQ-vision-for-youtube/pachckjkecffpdphbpmfolblodfkgbhl and Install it from here. Click on “Add to Chrome” Button and you will find a popup box, click on “Add Extension” button. If you find a logo of vidIQ extension on Chrome extension bar it means its installed. Now, your vidIQ Extension has been installed successfully, so we need to create an account. Now provide all information. 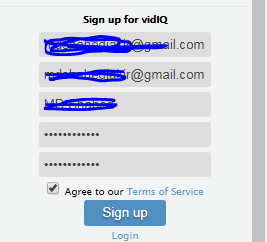 First, submit your email address, then submit email again on the second box, now type your full name on the third box, then choose a password, Attention, It isn’t your Gmail password, set a password for vidIQ. Type this password again. Click on the checkbox to agree to their Terms of Service. Click on “Sign up” Now your account will be created. vidIQ is easy to use. I will show you here how to use this. First of all, you can use this to know about your keyword position. Suppose your keyword is “rank YouTube video” you can search this on YouTube. You will find some information, see the screenshot below. Tags used on this video. YouTube Engage, Facebook Engage, YouTube Engage rate. Some data for this keyword, Monthly search, Highest view of a video for this keyword. Keyword Score, Search Volume and Competition score. This is for search result analysis. Now you can do an analysis of any video too. Click on a video you want to analyze. You will get all the necessary information you needed to get started. Thanks to read this. Share this with your friends if you want. Sharing is caring. Thanks again. YouTube is the most reliable and easy way to sharing video worldwide. YouTube is the most popular video sharing site through internet. YouTube members can upload, view and share videos. Member can subscribe YouTube channel and add to favorite’s video. In this tutorial, we will learn how to add YouTube channel keywords on YouTube channel. Channel keywords help to YouTube channel ranking. Due to a variety of benefits on YouTube channel, it became more popular than other social media like Facebook, LinkedIn, Twitter etc. YouTube is moving forward quickly because it has many unique visitors in each day. YouTube is also popular with younger generations because new entrepreneur, online marketer, Company or individuals can promote their product and service on YouTube channel. At present, YouTube has a second a highest visitor in a day, a first highest visitor is Google. Visitor of YouTube may be exceeded Google at any time. YouTube channel ranking is very much important to get more viewers and subscriber on your YouTube channel. Channel keywords help you to get more traffic for YouTube channel. If you face any trouble to understand our tutorial please contact us. Our support team will help you to clear your concept properly. Subscribe our YouTube channel and like our Facebook page to get a more helpful tutorial. Follow below step to use YouTube channel keyword for YouTube ranking. Click on Channel option on the left side of your channel. Input your Channel keyword on the Channel keyword box. After submitting channel keyword click on save button. You will see your changes have been saved. Generally, the users of YouTube channels use different keywords to find the video they need. YouTube Video Rank helps visitors to get videos what they want. A good quality channel keyword can increase your YouTube channel ranking. You should try to match your channel keywords with video content of your YouTube channel otherwise the visitor will not stay long after entering your YouTube channel. YouTube channel keyword plays a significant role in getting YouTube channel ranking, so choose the best quality channel keywords for YouTube ranking. You can get help from Google Keyword Planner before selecting the channel keywords. You can also take help from various sites to choose YouTube channel keywords. Hope, our tutorial will help you to add YouTube channel keywords on your YouTube channel. YouTube ranking help you to get more traffic. If you get more traffic you will get more viewers. If you get more viewers you will get more subscribers on your YouTube Channel. If you have any query regarding this video please comment below on this video or contact us. Like our Facebook channel and visit our website to get more relevant information. Thank you so much for stay with us. When it comes about online Marketing or advertising, LinkedIn has a great value. We know that LinkedIn is a social media website, but it also the biggest platform for business and companies and also for who want a job from here. On this tutorial, we are talking about the LinkedIn ad. We will learn how to post an ad on LinkedIn. So let’s start. To post an ad on LinkedIn you must have a company page on LinkedIn. First, go to https://business.linkedin.com/marketing-solutions/ads you will see a page like this. Now click on Create ad button on this page. Now you will see a page like below. Now you need to select an option from here. There are three types of ads on LinkedIn ads. Such as 1. Sponsored Content, 2. Text Content, 3. Mail Content. Sponsored Content: LinkedIn will show your ads on the news feed of your targeted audience. And there will be marked as “Sponsored Content” See an Example here. Text Content: Your ad will be shown on the sidebar of LinkedIn Homepage. Here is an Example. Mail Content: It is something different from Sponsored contents and Text Contents. On this type of ad LinkedIn will send your ad to the LinkedIn mailbox of your targeted audience. These are three types of LinkedIn. Now come to the next step. Now we need to select any one of them that type of ad we want to post. The Example I selected “Sponsored Content” from here. Now you will see this page. I want to get people on my website, so I selected Number 1. Now you will find this. Now you need to select your ad format. What is your ad format? Is your ad text based? Or link based? Or Image? Select number 1 if you want any of those. Or if you want to publish a video on your video then select number 2. Now, this is the page where you can publish your ad and manage them. You will find this where you can see your ads that you published. Select your ad and click on “Next” button you will see all data about your ad. So now you know how to publish your ad on LinkedIn. Thanks for reading this. LinkedIn is a social network platform for business and employment. You can connect people with your company/Organization by creating a LinkedIn group. The LinkedIn group will help you to expand your business and create new business opportunity. A LinkedIn group is very similar to a Facebook group but LinkedIn will give additional advantages because the LinkedIn group will connect your business with other professionals easily. Now we will explain details how to create a LinkedIn group for your business. Besides, we’ll also show you how we can decorate our LinkedIn group, how to add a member in a LinkedIn group, how to submit and share a post on LinkedIn. Logged-in LinkedIn account then go to your profile page. Click work menu in the navigation bar of your LinkedIn homepage. Click the Group Icon in the upper right corner of work menu. You can see two options in the group Icon. Select My Group tab at the top corner of the page. Now you will see all LinkedIn group if you have already created. You’ll also see create group. Click at Create Group to create a LinkedIn group. Group Title: Write your group name here. Description: You can describe your organization/Company profile. Can be added product or services. You need to explain shortly what you are going to sell or promote products/offers like ( CPA, Affiliate or others). Group Rules (Optional): You may describe rules and regulation of your business. You can mention duties and responsibilities of your organization. We will select standard group because we create the LinkedIn group for connecting people to our business or professional activities. Save Change: click the save changes button after fulfilling the above information. Already we discussed how to create a LinkedIn group. Now we will see how we can decorate nicely your LinkedIn group for your business. Click my group option of your LinkedIn group. Click group and upload a profile picture. Click invites others and invites members to your LinkedIn group. You can send one or more invitation at the same time. Member will be added to your LinkedIn group after accepting your invitation. Manage members: You can add group manager or moderator on your LinkedIn Group. If you want, you can delete group member by using manage option. You can also approve or delete members post. You can see an invited list and sent a new invitation for new members. If you want to block any member you can block member by clicking block user. Post on your LinkedIn Group: You can post conversation from the main page. Enter start conversation with your group. You will get three options 1. Post conversation 2. Share a Job 3. Sent an announcement. Write conversation title on the title bar and write details on conversation box. If you want you can upload image file by clicking the image icon. Click the post button for posting conversation on a LinkedIn group. LinkedIn connecting your business with other professionals and participating by a LinkedIn group. Hope, you learned and enjoyed this article. In the next tutorial, we will discuss how to create a company/business page successfully. And to get more helpful articles subscribe our YouTube Channel and join our Facebook group.